Several friends and bloggoddess Karen at A Certain Age have contacted me about pearl buying. Thanks for unleashing my passion, as if I need encouragement. so that, if you know about pearls, you can just read the tips, and if you'd like to know more about what makes a pearl wonderful, the value factors. I won't include info about types of pearls here. For that, go to Pearl Guide and read the "Cultured Pearl" section; this site dives deeply into mollusk matters. Finally, fakes are fun, fine for what they are– but this post is about genuine pearls. Many jewelers know zip about pearls, and get away with it because the customer knows even less. When I took my pearl-grading courses, I found most jewelers there were indifferent to pearls; they fixated on diamonds, with their high margins and desirability. They sold pearls for wedding gowns or graduation, and only because they 'had to carry them'. Many are contemptuous of Chinese freshwater pearls (CFW). The reason: CFWs are at least 3-4 times cheaper than saltwater pearls of comparable quality, and therefore less profitable. Those jewelers are unaware of what the Chinese are producing. When an instructor passed around a strand of Chinese 12mm perfect round pearls with intense inner glow and mesmerizing orient, one said "Seeing these, why would anyone buy saltwaters?" "You have to wonder about that", replied the instructor as fifty jewelers gnashed their teeth. I'm going to focus on CFWs in today's post. South Seas and Tahitians are exquisite, but deserve their own post, and Akoyas (the classic Japanese white pearl) are too conventional to raise my pulse. 1. If you are over 40, don't buy pearls under 9.5mm unless they are multistrand or mixed with other sizes or gems. They will look bitsy regardless of your size. 2. Chinese freshwater pearls (CFWs) will be the best buy. They have very thick nacre so wear and age well. But be picky as the market is flooded with poor to average material. 3. A high quality pendant, ring or pair of earrings is a better purchase than an average strand. Looking at lots of pearls is wise, but a beautiful pearl will sing to you clearly, surely, charmingly. 4. If buying pearls temporarily strung (no knots and clasp), count on the finished strand to be about 2" longer. Therefore, minimum length for an unfinished strand is 16" unless you want a tight choker or have a really slim neck. 5. Think about comfort. That 5-foot rope is fun to play with but worn all day, may be too heavy. 6. Necklaces that can be extended by hooking two strands together sound like a good idea but look ungainly, like those pants that unzip to shorts. 7. Brightly-colo ured dye jobs (teal, orange, red) are like putting a tutu on a terrier. The essence of the pearl is perverted. The quality (and therefore price) will depend on the "7 Value Factors": size, shape, colour, lustre, surface quality, nacre quality, and matching. Today's post covers the first three factors. There are now more large sized CFWs due to improved farming methods, so if you received a 6mm-7mm strand for your graduation or wedding, it will look small now. They also sell a premium CFWP called "freshadama"; an 18" strand of 9-9.5mm is $1,130. But notice that the pearls are not as big. If I were shopping, I'd call the nice people in Paradise and ask to see a strand of each. If a 9.5-10mm strand is beyond your budget, consider a Tin Cup style (pearls interspersed by chain). Shown Tahitian 10mm-11mm Tin Cup 18-inch strand, $765 from Pearl Paradise. Round or near-round freshwaters are presently quite rare in sizes above 12-13mm but getting bigger by the year as the Chinese refine their methods. So if you want big 14mm-20mm honkin' mamas like Ms Clinton or Ms Pelosi, you are buying South Seas (pearls from Australia, Indonesia, and the Philippines) or Tahitians. A strand bought in North America will cost around $6,000 to a quarter million depending on size and quality. 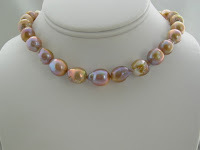 Shown: 12.1mm-14.1mm white South Seas 18" strand from Pearl Paradise, $10,200. Whether you're spending big money or not, consider the other pearl value factors. The most expensive are perfect spheres. I prefer slightly off-round (or near-round) over these, which can look fake. I'd rather have superb colour and generous size. Symmetrical (but not spherical) shapes: You will also see ovals, buttons or drops (pears). I like their character and they will be cheaper than perfect rounds. Baroque pearls look more casual and are much cheaper than rounds. The orient is often more pronounced than on rounds. Jewelers can be contemptuous of baroques, which suits them, not you. 2. Overtone: One or more translucent colours that float over the body colour like a colour glaze on hair. The most typical overtones are rosé, green or blue. More than one overtone may be present, especially on Tahitians. So the colour of a pearl equals body colour plus overtone, if overtone is present. 3. Orient: The iridescent, shimmering rainbow of colours (pink, green, yellow, orange, blue) on or just below the surface. Orient looks like oil on water, shifting with the light, and may be more intense in one area than another or present only on part of a pearl. Pearls with irregular shape are more likely to display orient. A pearl can have overtone but no orient; this is fairly common. Many salespersons confuse overtone and orient. A pearl can also have neither overtone nor orient– that's a boring pearl, about as interesting as styrofoam, but it's what many people are used to seeing. A fine pearl whispers, breathes and has an essence that emanates from within. And just like us, it does not have to be perfect to be beautiful. That depends on your colouring and taste. Avoid stark white pearls with no overtone or orient. If this kind of pearl has high lustre (covered in the next Buying Pearls post) a jeweler might say, "Look, you can see your reflection!" Big deal, this will be a cold, soulless pearl. Most CFWs undergo some type of post-harvest processing: cleaning, buffing, and bleaching to create whiter and more even colour. These standard processes need not be disclosed. Dyeing, irradiating and coating a pearl is considered a treatment. The dye (or radiation) is usually stable. Jeremy Shepherd, owner of Paradise Pearls, has commented that he has seen some dye fading in CFWs over years; other pearl mavens have not, nor have I. But he's seen a zillion more pearls than I have or ever will. However, for a few hundred bucks' investment, I wouldn't worry. If you are buying CFWs and the colour is gray, black or golden, they are dyed– nothing wrong with that, but the jeweler should disclose the fact. If the pearl is pink, peach, or lavender or taupe it could be natural or dyed. Sometimes dyed and natural coexist in the same strand. Some dyed pearls are lovely; don't disqualify pearls for this reason if they speak to you. The pearls at the top of this post are undyed baroque CFWs, called "pondslime" for the distinctive green-gold-taupe-pink uneven coloration. $150 for a 9.2mm-11mm strand from Kojima Pearl. 1. These pearls are very rare! Do your research. Pearls are not rare because they are chocolate-coloured, or gray and white mixed strands, or "spice pearls from Thailand" or shaped like sticks, crosses or Buddhas. What they might mean is "the only ones like this we have". Or it's BS. When a jeweler specializing in pearls says "rare", listen, but do your research. 2. These pearls are natural! Very few pearls are natural, among the rarest gems. You can buy them; see the Exotic section of Pearl Paradise's site. Their ring, set with one natural pearl, is $1,050. A matched strand would be priceless. What the young, inexperienced salesperson may mean is that the colour is natural. 3. "We can sell it to you cheaper because...!" Maybe so. But I have been prices that are insanely inflated. Craft shows are the worst. I've seen a $325 tag on a crappy strand of 7mm dyed potato (shaped) pearls that are worth maybe $25. I don't care if the clasp is handmade, this is robbery. I've also had artisans tell me the pearls are more expensive because they are baroque. Many artisans are informed and honest, but others put a sale before accuracy. Some women believe anything said by the person who made the piece. Do your research first on reputable sites like Pearls of Joy, Pearl Paradise or Carolyn Ehret's eBay store, Ehret Design Gallery. Shown, Ehret Design Japanese Kasumi pearl and spinel bead earrings, $499. Tomorrow, more on the value factors, and on pearl buying tips. Don't be afraid of buying pearls! Learn a little and you will glow in them. Duchesse, I've noticed that you continue to post 'only' three days a week, as during the summer. I had been hoping that you would return to daily posting, but I've realised that your posts are now even more informative and must require a great deal of research. Bravo and thanks! As Patricia, I have wondered the same thing, but quality always comes before quantity! Speaking about pearls, I received ( chose it myself though ) as an anniversary gift a perfect round multicolor ( grey,white and yellow ) Tahiti and South sea pearl necklace 16.0mm-17.2mm. Needless to say- I´m still in love with it ! Thanks so much for this pearl post! Patricia: Thanks for your enthusiasm and support; three days is all I can manage given the rest of life! metscan: Oh, wish I could see your necklace, sounds magnificent. Duchesse, this is such great information! I've still had a hankering for those Zara Scofield pearls you posted a few months ago, and still want to go visit her shop. I'll take notes from this and subsequent posts with me when I go pearl shopping now. "Akoyas (the classic Japanese white pearl) are too conventional to raise my pulse." I'm a new student to this subject. Would Mikimoto be in this category? What a Splurge: Yes; I prefer other types of pearls, and orient with a soft glow to a mirror-like surface. If you like Akoyas (many do), Mikimoto's AAA-graded top-quailty pearls will show amazing lustre and perfect match. An 18-inch 7.5 mm strand will cost over $10,000. You are paying a premium for the brand, like a Tiffany diamond. Their "Blue Lagoon" and "Sea Magic" brands are less, as are the pearls they supply for the "Gordon's Classic" (sold at Gordon jewelers) and Zales' Signature Collection, but the quality is less, too. After looking at Mikimoto, I would go to Peal Paradise and check their "hanadama" line. Mikimoto also carry Tahitians and South Sea pearls. Gorgeous pearls, again, tippy top prices. Oh the stories of pearls. The pearls for the the 21st birthday, those purchased in India, the new ones...I have to say though I believe the ones I wear now are 8.5mm. They feel large enough, but then I am fairly small. I love them...oh, and pearls and diamonds TOGETHER are my favorites. LPC: Something about pearls, they do have stories. Since they aren't farmed in India, the ones I bought there are likely Thai or Chinese. Wish I'd bought more, as the one multistrand piece I got, I gave as a gift. Pearls and diamonds and gold, a classically beautiful combination. Thanks: a feast for the mind and for the eye. Duchesse, you've written a very informative, easy to understand post on pearls. The world of pearls can be so confusing and full of misinformation and untruths. Your post will help enlighten your readers. A note from my professional experience - as a GIA Graduate Gemologist, GIA Pearl Graduate and a jewelry designer, I do see fading in many dyed FW pearls. This of course is more prevalent in the brilliant colors but can occur in the pastels also. I look forward to your next post on pearls! Mary: Thanks; I'm not entirely surprised to hear some of the brights fade, especially with so much lower end material out there. Pearl Prof: Thank you for reading and commenting! What a wonderful and informative post. The more informed buyers are the better choices they will make, when buying pearls, whether Chinese, Japanese, Tahitian, South Sea, American Freshwater or Natural. I love pearls and wear baroque CFPs for casual events and big honking South Sea strands for important events. 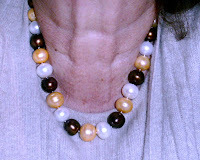 I tend not to wear Tahitians because the darker pearls aren't flattering to my coloring. I also stay away from dyed or treated pearls. I am very impressed with the quality of Chinese pearls and I have never understood how Mikimoto could get away with charging such high prices for their AAA Akoya strands when I can make a 6.5-7mm AAA Akoya necklace for about $1000. Duchesse: you are truly generous to educate us as you do. Thank you! Good God! Thank you for reminding me that I've been meaning to look for pearls for custom cufflinks FOR WEEKS! Writing a note to myself now. I suppose it wouldn't be very subtle to copy this out for Pater . . . but I'd trade subtlety for efficacy. . .
Great pearls of wisdom..I have 3 strands of 7mm which I layer or wear the longest with a diamond enhancer...I feel somewhat dowdy now as I am a larger gal with smaller pearls. I guess I need bigger pearls or a diet! Belle: I know you wear (and carry) some beautiful pearls, Belle! If you source some big baroque CFWs please let me know. Wendy: Hope you post those when you've made them! materfamilias: This could be a reason to visit LA, grab Pseu and visit Priceless Imperfection (Zara Scoville). s. It's a pleasure, as I love pearls. I love your pearl posts and there is so much wonderful information here. I am still toying over what I want, although I suppose when I see it I will know. I do know the smaller pearls given to me at a much younger age seem too young now. Lovely! Thank you so much. This is wonderful research and could be published somewhere. There's nothing like a pearl. I don't have many, but I treasure the ones I have. What a wonderful, informative post. I would like to add that along with pearl size, one should consider the length of the strand of pearls. A 'standard' 18" strand hits me in the most unflattering place, as my neck is slender. I have also seen the opposite; an 18" strand on a much larger neck. Both are unflattering. I have my strands custom-sized by Mary, of http://www.marylogingdesigns.com/marylogingdesigns.html and it truly makes a difference. Thanks again for sharing! Nancy: Thank you! Looked at Mary Long's site and found the "Sweet Spot" info very useful. Most of her designs are faux pearl, so she can make up any length. If buying finished genuine pearls, one is usually confined to the standard 16, 18, and 20-inch and longer lengths. If buying temporary strands, you can have the finished piece made to the most flattering length, given enough material. Festive in flats: What would Carla choose?